Nothing looks cooler than a huge tip completing your exhaust system. 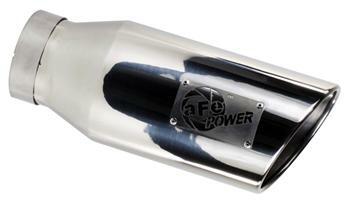 The aFe Power Tip is constructed out of 304 or 409 stainless steel and available in either a high lust polished finish or high-temp black powder-coated finish. With a choice of a straight or slash cut tip emblazoned with an aFe Power logo, you can be sure to get exactly what you want. A drain port on the bottom keeps rust and corrosion away. For installation, the aFe Power Tip can be bolted on or welded on.